NASA’s Lunar Atmosphere and Dust Environment Explorer (LADEE) has completed the commissioning phase, and now is ready to begin the mission’s primary science phase. After the successful Orbit Lowering Maneuver (OLM-3) on Nov. 10, LADEE was in an elliptic pre-science orbit. 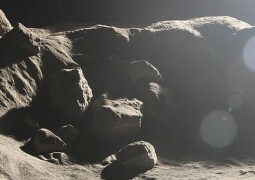 The first six days in this orbit were dedicated to completing the science instrument commissioning, doing opportunistic science measurements in coordination with NASA’s Lunar Reconnaissance Orbiter (LRO) spacecraft, and taking measurements of the impact of the Leonids meteor shower on the lunar environment. The team was able to conduct preliminary science activities when LADEE’s orbit brought it closest to the surface of the moon and across the sunrise terminator – the transition from night to day. After those science activities LADEE completed the fourth and final block of Lunar Laser Communication Demonstration (LLCD) operations in the commissioning phase. Everything has been going very well during commissioning activities, even though we sometimes had to deal with unexpected events. For example, on Nov. 19, at the end of an LLCD downlink of spacecraft main memory, LADEE experienced an unexpected processor reboot and came back up in safe mode. A safe mode is a self-protective measure that the spacecraft takes when something unexpected occurs. After re-establishing communications and looking at the data leading up to the event, the engineering team determined that the reboot was triggered by a watchdog timer. These timers are designed to detect when the spacecraft processor stops responding, indicating that something unusual has happened. This could occur for a wide variety of reasons, from a radiation event to a high-priority software overloading LADEE’s onboard computer processor. Engineers were able to determine the event data was clean leading up to the reboot, so after initial analysis the team decided to bring the spacecraft out of safe mode and continue the LLCD experiments. The spacecraft and LLCD have performed normally since that point. Once the LLCD experiment phase was completed, the team prepared for and performed the OLM-4 maneuver at 8:53 p.m. PST Nov. 20. This main engine burn lowered the spacecraft into the final science orbit, which varies between 20 and 60 Km above the lunar surface. The varying altitude is caused by the moon’s uneven gravity field. This was the final planned use of the large main engine on the LADEE spacecraft, which has served us extremely well during the mission. The mission now is ready to perform the main science measurements over the next several months.